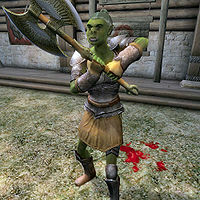 Bumph gra-Gash is an Orc crusader and a member of the Bruma Fighters Guild. She offers basic training in Heavy Armor but will only offer her services to members of the Fighters Guild. The Bruma chapter of the guild is among the smallest guildhalls in all of Cyrodiil, and with only one other member present, namely the Argonian Blade trainer Right-Wind, Bumph tries her best to make the most of it. She sleeps in the basement area every night between midnight and 6am. After waking up, she heads upstairs to the ground floor and spends four hours strolling around there. At 10am, she meets up with Right-Wind in the big practice area for an intensive four-hour sparring session. At 2pm, she leaves the guildhall and goes down to Olav's Tap and Tack to take her lunch and socialize for two hours. After she has finished her meal, she re-enters the guildhall and goes down into the basement for three hours of relaxing. At 7pm, she heads upstairs and watches Right-Wind train, before she finally sits down at 8pm for a four-hour dinner. At midnight, she returns to the basement and her bed. She will offer training at all times, except when eating or sleeping. The only exception to this routine occurs when Martin leads the allied Army out to the Defense of Bruma, when she is one of the citizens who cheers as he leaves. Bumph wears iron armor, including boots, a cuirass, gauntlets, and greaves. She sleeps in doeskin shoes, a quilted doublet, and tan linens. She wields a leveled blunt weapon that can be enchanted at higher levels. She also carries a small amount of gold. She has a leveled selection of crusader spells from the Destruction and Restoration schools as well as an additional minor Restoration spell. When asked about the city, Bumph comments: "Yeah, you think Bruma's cold, try a winter in the Wrothgarians. Bruma's a day at the beach." People around Bruma know of her ability with heavy armor and will often comment on it, saying: "Bumph gra-Gash is very skilled in heavy armor use. I wouldn't want to get on her bad side", "I understand Bumph gra-Gash trains other Fighters Guild members on the proper use of heavy armors", "Is there a better person to learn heavy armor skills from than Bumph gra-Gash? ", and "Did you know that Bumph gra-Gash will train you to use heavy armor, but only if you're a Fighters Guild member?" Other will reply: "She's quite a warrior. It's amazing how well she moves in heavy armor. ", "It takes a skilled fighter to move well in armor that heavy. ", "She moves really well in that armor, that's for sure." and "She seems skilled in its use. I can see why the Fighters Guild has her training others." Esta página foi modificada pela última vez à(s) 19h42min de 3 de abril de 2015.